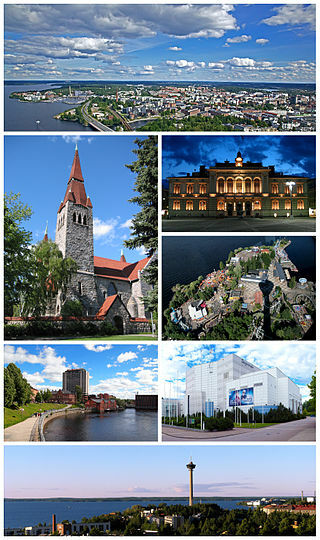 Tampere is the third largest city in Finland and the largest inland centre in the Nordic countries. Currently there are 228 173 (25.1.2017) inhabitants in Tampere, and close to half a million inhabitants in Tampere Region, which comprises Tampere and its neighborhood municipalities. Tampere’s population density is 689 per square kilometres (incl. water/lakes 165). Tampere is one of the three most rapidly developing regions in Finland. Half of the population is women, students about 22000, educated people ie. 2/3 has a qualification after primary school. The tax rate of 2017 is 19,75. Tampere’s city centre is surrounded by lake and ridge scenery, sited on an isthmus between lakes Pyhäjärvi and Näsijärvi. The Tammerkoski rapids run through the city. Pyynikki, which was formed by the action of ice and sea more than 10,000 years ago, is the world’s highest gravel ridge. At its highest it rises 80 metres above Lake Pyhäjärvi and 160 metres above sea level. There are 200 lakes and ponds in Tampere, and a total of 450 in the entire region. 24 per cent of Tampere’s surface area is water and 76 per cent land. 18.5 per cent of the land has a town plan. There are numerous nature reserves in Tampere. Pyynikki and Viikinsaari near the city centre are the best known of them. Parks and green areas amount to 2,400 hectares, approximately 100 square metres per inhabitant. The city also has four allotment areas. The Hatanpää allotment, established in 1916, was among the first in Finland. Having a home is one of the most important needs of a human being. Population growth in Tampere increases the need for homes, which in turn threatens to create a similar increase in prices that we have seen in the metropolitan area. Everyone should be able to afford a home - be it their own or rental. Tampere has financially done quite well. Success is not permanent, however, if we do not focus on steadily creating new jobs. High level of know-how and availability of work force must be taken care of. Good and operational transport and communication networks are a basis for business. High level of unemployment, especially long-term unemployment, is one of the greatest social evil. The city must carry its responsibility in creating employment. In accordance with the social democrats' value tradition, the functionality of society is measured by how it takes care of its weakest members. Solidarity and joint responsibility must be brought to practice. Health promotion and preventive health care must be outlined as priorities. Resources within social services must be focused towards families with children and towards recognising and supporting youth in danger of social exclusion. The elderly must receive necessary care 24/7.Cultural and leisure activities must remain reasonably priced. As a part of the purchaser-provider model, the possibility of a cultural voucher must be pursued. Favouring public transport is a prerequisite to sustainable development. It is key in the struggle against climate change. The attractiveness of public transport must be improved in order to secure equal possibilities for citizens to move around. When planning community structure, public transport must be considered in relation to services. Work done by municipal workers is just as valuable and competitive as anyone else's. Personnel are the greatest resource any employer can have. In launching a new operating model, a motivated and committed employee is the key to success. The city's image as a good employer guarantees that the city is a desired employer and work force is available. Basic services must be produced mainly by the city itself. People must be able to influence their immediate surroundings, not just as citizens and voters, but as service users, employees, consumers and community members. When people network and communicate within the municipality and in their area, democracy will increase. The work of civic organisations is vital to the functionality of democracy. A stable municipal economy is a worthy aim, but it has no intrinsic value. Taxation must remain at a level which guarantees adequate quality services. Efficiency of service production must be developed in collaboration with personnel. Profit expectations for the city-owned companies must be outlined for four years at a time in order to stabilise city finance policy.